Volume 2 of Sabotage's 'The Hawaii Tapes'. 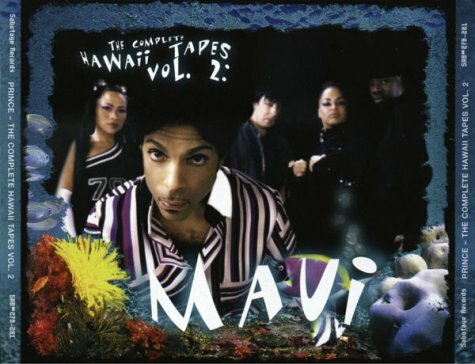 The Maui volume comes as a 3cd set, however if you purchased it at the same time as the The Complete Hawaii Tapes Vol.1: Honolulu, (i.e. - if you shell out double the $$) then this volume comes with a bonus 4th disc full of soundcheck material. As with the first volume, this is an excellent audience recording. There really is nothing to separate the two concerts, both set-wise and sound-wise. The only difference being 'Adore' makes a brief appearance here, along with a slightly extended 'Purple Rain'. The Maui aftershow packs slightly less of a punch than the Honolulu (or Honalula, as P says), but it's still a masterclass in tight funk filled extended jams (Yeah, I know Prince fans are spolied brats - give them a concert and an aftershow with excellent sound, and they STILL say "It's good.........but".) The bonus 4th disc contains material from the Maui and Honolulu soundchecks. They are (on the whole) instrumental jams. The standout tracks is obviously 'Head', but there are no filthy lyrics this time around - it's instrumental. As with the Honolulu release, the art-work is superb.